World Premiere recording of Harrison's last major work, Concerto for Pipa and Strings, and first complete recordings of his Suite for Symphonic Strings and Suite no. 2 for Strings. The present recording traces the development of Harrison's creativity over a half century - from 1948 to his last large-scale composition (1997). The Suite No. 2 for Strings was written while Harrison lived in New York. Having spent his formative years in San Francisco, Harrison had a great deal of trouble adjusting to East Coast big-city life. A nervous breakdown required him to be hospitalized for about nine months. The Suite No. 2 dates from the year after this traumatic event, and signs of Harrison's mental stress are apparent, particularly in the torturous and difficult second movement. But also in evidence is the tranquility he sought from religion during this period and the more transparent textures he would favor later. 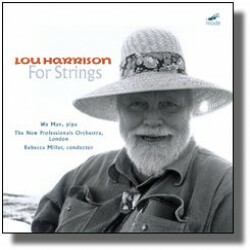 This CD presents the first recording of the work by a string orchestra - Harrison's original intent. The lengthy Suite for Symphonic Strings was a commission from BMI. By this time Harrison had returned to the San Francisco region. The bass and cello sections provide percussion accompaniment, the players hitting the bodies of their instruments with their fingers and using guitar picks on the strings to achieve a percussive pizzicato. This is the first recording of the complete nine-movement work. Harrison had been interested in Asian music since his early years. The late Concerto for Pipa is a model of Harrison's trans-ethnicism, evoking the many influences that had attracted him over a half century. The work ends with an extended, medieval-inspired estampie, a virtuoso tour-de-force for soloist and orchestra.